Non Hifi related general mumblings and ill-formed thoughts. OK, so I bit the bullet and sold one headphone; my B&W P7 Wireless… If I had cash to spare I would’ve happily kept these in a drawer ‘just in case’ and for the occasional time I was in the mood for their sound signature. However I have been using them less and less, finding them uncomfortable and with all their benefits duplicated (and executed better) with another headphone; Sony MDR 1000x selling seemed the best option. Plus they have held their value well; they sold within a few hours and I got slightly more than I paid for them more than two years ago! B&W P7 BT Wireless – Sold ! Initial impressions of the Beyer; Similar sonic signature to the AKG K712 but not quite as open and with slight sibilance evident on certain vocals. Bass is slightly more prominent though. Hmm- these may be sold in the future.. but that said, these are the most beautiful and luxurious feeling/looking headphones I have owned. Wearing them is like putting fluffy slippers on my head. Can anyone beat this amount of baggage to make their headphones ‘portable’ ? Bumbag now essential. Stuffing a mojo and a phone and associated cabling in my trouser pockets was just silly. Posted on April 10, 2018 April 10, 2018 Categories DAC, headphones, UncategorizedTags AKG, chord mojo, headphones, wearable hifiLeave a comment on Can anyone beat this amount of baggage to make their headphones ‘portable’ ? I wonder what people’s opinions are on B&W headphones? Reason I ask is because my opinion on the sound quality of the P5 and P7 has changed from an initially negative one (1st listen to demo pairs in a shop) to an extremely positive one (once I owned them) and recently back again to negative (once I heard something better, but not more expensive). There is no doubt that these models are mostly very well reviewed – all except for Which? reviews, which has had the audacity to award most B&W headphones ‘don’t buy’ status – well below 40% on their review scale. In fact I commented to Which? on this anomaly, very indignantly stressing how wrong they were and that their reviewers must have cloth ears and/or have the ‘phones plugged into a transistor radio, etc etc. This was during my middle, ‘positive’ opinion phase. Now I’m starting to see Which?’s point. Do we just get used to a sound and never be truly objective, or do we only hear the real worth of a hifi component when we compare it with something far superior? Do headphone cables have sentience? Or are they possessed? Either way, they have an uncanny ability to get trapped under feet, furniture, pets, chairs.. but mainly my own feet. No matter how careful I am, as soon as I stand up or move in any way, there’s that familiar tug (stop sniggering at the back there) against your head as the living cable tries to wrench the headphones off your head. Mind you, the AKG’s do have rather a long cable. But I swear the cable creeps under my feet of its own accord. Would somebody please invent a repellent cable which automatically moves away from objects ? Thanks awfully. Posted on April 4, 2018 Categories headphonesTags AKG, akg 712k, headphonesLeave a comment on Do headphone cables have sentience? Does ‘ripping’ from a CD affect quality? I may not have golden ears (they’re silver, remember? ), but I have never been able to detect a difference in quality from a ripped CD. However just the other day I was listening an album recorded on my phone (from a CD), then ‘cast’ via google’s Chromecast Audio (which is supposed to transmit data be bit perfect and uncompressed). I was listening via my NAD pre-amp, Arcam power amp and Castle speakers – one of a variety of systems I have built over the years. I then put on the original CD and sent it via the same DAC (the mojo) via its co-ax connection and onwards through the same analogue chain. The difference was actually quite stark. And that was allowing for gain differences (not always easy but with practice on the volume control and repetition I can learn to discount this factor). Although the cast version continued to be perfectly pleasant and listenable, compared to the CD, the bass was flabby and the imaging was quite noticeably more 2D, confining layered female singing voices to left and right, whereas the CD brought them out in from of the speakers to a certain extent. I am quite surprised by the less than subtle results here. I know that I am in fact comparing more than one change at a time (CD direct versus a rip copied to a phone and cast via another piece of hardwear, but that said, in theory the above all takes place in the digital domain and should be transparent. Anyone have any comments on this? Feel free to say I’m imagining the differences – it’s all digital innit? or conversely, that what was I expecting- I’m comparing apples and oranges … discuss…..
Posted on April 2, 2018 April 3, 2018 Categories Hi-FiTags castle speakers, chord mojo, Chromecast audioLeave a comment on Does ‘ripping’ from a CD affect quality? Hifi cliche alert- new kit allows me to hear details on familiar tracks that I’ve never heard before! Oh my lordy! 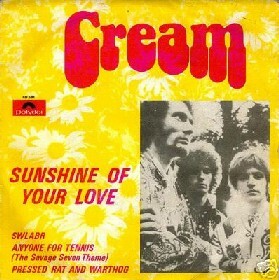 I was taking a break from listening to new music and put on an old classic; Eric Clapton / Cream – Sunshine of your love. Has anyone else heard yelps and subsonic thumps near the end of the track? I’m listening on my AKG K712Pro’s and Chord Mojo ; walking around like a fool with wires and hardwear in every pocket. But increasingly I’m finding it hard to listen to anything else; even speakers.. the sound from this set-up just makes me smile, smile and smile some more. I did a quick google and also replayed the section a few times to ensure I wasn’t just hearing something from outside (the AKG’s have virtually no sound isolation), but no, the studio sound is there. Impressed much. This is why I’m into hifi. Little moments like that, justifies the money I’ve spent over the years. Posted on March 31, 2018 April 3, 2018 Categories headphones, Hi-Fi, UncategorizedTags akg 712k, sunshine of your love, upgraditisLeave a comment on Hifi cliche alert- new kit allows me to hear details on familiar tracks that I’ve never heard before! I tend to avoid equalizers of any sort like the plague, but for the princely sum of £3.50 (in-app purchase from USB Audio), I thought I’d giver it a try, as every pair of headphones I have, have some element of their presentation that I’d like to change..
Posted on March 27, 2018 April 3, 2018 Categories Computer audio softwareTags equalizer, morphit, usb audioLeave a comment on Morphit – Opinions?